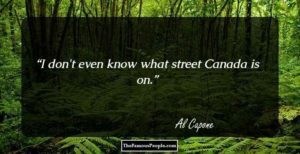 Inspired by the great previous 1990 publication called “The Quotable Al Capone” by Mark Levell and Bill Helmer, here below, on this page are a few bonafide and verified Al Capone quotes from the new version called The Wisdom of Al Capone.Alphonse Gabriel “Al” Capone was an American gangster who attained fame during the Prohibition era as the co-founder and boss of the Chicago Outfit. 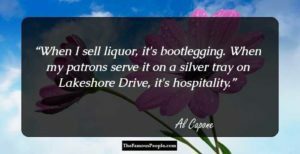 Looking for the best Al Capone quotes? 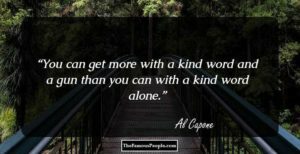 We’ve compiled a list of the top 45 Capone quotes and sayings on kindness, life, people, business, government and more. Bolshevism is knocking at our gates, we can’t afford to let it in. We must keep America whole and safe and unspoiled. We must keep the worker away from red literature and red ruses; we must see that his mind remains healthy. 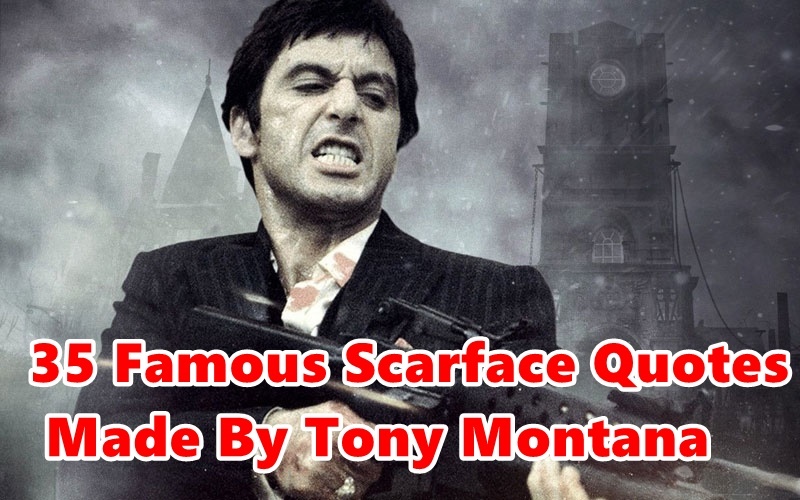 Every time a boy falls off a tricycle, every time a black cat has gray kittens, every time someone stubs a toe, every time there’s a murder or a fire or the marines land in Nicaragua, the police and the newspapers holler ‘get Capone. I got nothing against the honest cop on the beat. You just have them transferred someplace where they can’t do you any harm. But don’t ever talk to me about the honor of police captains or judges. If they couldn’t be bought they wouldn’t have the job. A crook is a crook, and there’s something healthy about his frankness in the matter. But any guy who pretends he is enforcing the law and steals on his authority is a swell snake. The worst type of these punks is the big politician. You can only get a little of his time because he spends so much time covering up that no one will know that he is a thief. A hard-working crook will and can get those birds by the dozen, but right down in his heart he won’t depend on them-hates the sight of them. I’ve lost a million and a half on the horses and dice in the last two years. 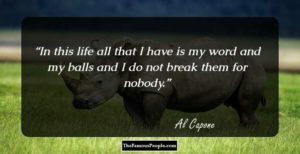 And the funny part is, I still like ’em, and if someone handed me another million I’d put it right in the nose of some horse that looked good to me. I have always been opposed to violence, to shootings. I have fought, yes, but fought for peace. And I believe I can take credit for the peace that now exists in the racket game in Chicago. I believe that the people can thank me for the fact that gang killings here are probably a thing of the past. The funny part of the whole thing is that a man in this line of business has so much company. I mean his customers. 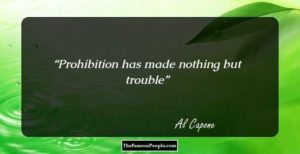 If people did not want beer and wouldn’t drink it, a fellow would be crazy for going around trying to sell it! I never stuck up a man in my life. Neither did any of my agents ever rob anybody or burglarize any homes while they worked for me. They might have pulled plenty of jobs before they came with me or after they left me, but not while they were in my outfit. It’s pretty tough when a citizen with an unblemished record must be hounded from his home by the very policemen whose salaries are paid, at least in part, from the victim’s pocket. You might say that every policeman in Chicago gets some of his bread and butter from the taxes I pay. Why not treat our business like any other man treats his, as something to work at in the daytime and forget when he goes home at night? 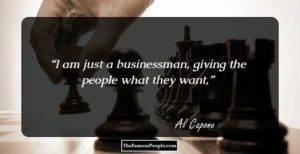 There’s plenty of business for everybody. Why kill each other over it? People who respect nothing dread fear. It is upon fear, therefore, that I have built up my organization. But understand me correctly, please. Those who work with me are afraid of nothing. 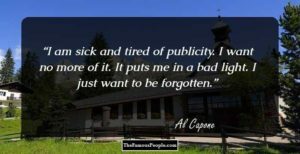 Those who work for me are kept faithful, not so much because of their pay as because they know what might be done with them if they broke faith. I’m the boss. I’m going to continue to run things. They’ve been putting the roscoe on me for a good many years and I’m still healthy and happy. Don’t let anybody kid you into thinking I can be run out of town. I haven’t run yet and I’m not going to. All I ever did was sell beer and whiskey to our best people. All I ever did was supply a demand that was pretty popular. Why, the very guys that make my trade good are the ones that yell the loudest about me. Some of the leading judges use the stuff. You gotta have a product that everybody needs every day. We don’t have it in booze. Except for the lushes, most people only buy a couple of fifths of gin or Scotch when they’re having a party. The workingman laps up half a dozen bottles of beer on Saturday night, and that’s it for the week. But with milk! Every family every day wants it on the table. The people on Lake Shore Drive want thick cream in their coffee. The big families out back of the yards have to buy a couple of gallons of freshmilk every day for the kids…. Do you guys know there’s a bigger markup in fresh milk than there is in alcohol? Honest to God, we’ve been in the wrong racket right along. I’ll be made an issue in the next presidential campaign. 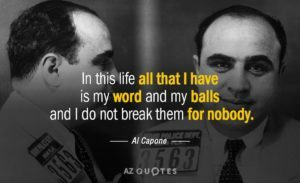 We sent Capone to the penitentiary, they’ll be saying. It wouldn’t seem so bad if they didn’t use the income tax for political purposes. There’s a lot of big men in Chicago who beat the government out of most of the taxes they ought to pay and they get away with it. I don’t think that’s playing fair, but they’ve got me and I’ll have to take the medicine. I was willing to go to jail. I could have taken my stretch, come back to my wife and child, and lived my own life. But I’m being hounded by a public that won’t give me a fair chance. They want a full show, all the courtroom trappings, the hue and cry, and all the rest. It’s utterly impossible for a man of my age to have done all the things I’m charged with. I’m a spook, born of a million minds. 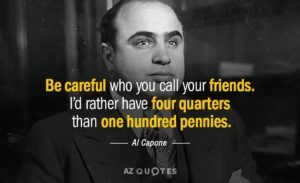 If Al Capone is found guilty, who is going to suffer-a masquerading ghost or the man who stands before you? You’re right; it’ll be me who goes to jail. Well, I’d much rather be sitting in a box watching the world baseball championship. What a life! 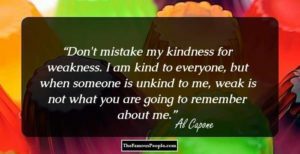 I’m a kind person, I’m kind to everyone, but if you are unkind to me, then kindness is not what you’ll remember me for. 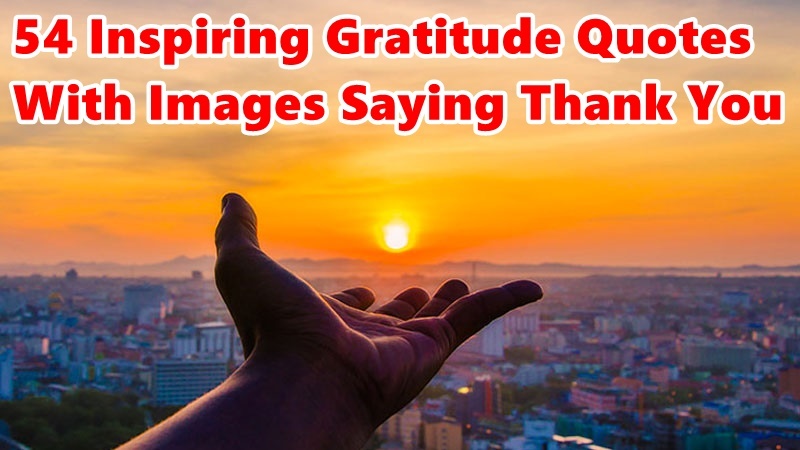 You accomplish more with a smile, a handshake, and a gun than you do with just a smile and a handshake. 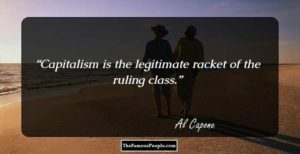 Capitalism gives all of us a great opportunity if we seize it with both hands and hang on to it. 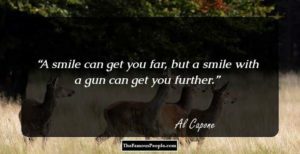 A smile can get you far, but a smile with a gun can get you further. You’d be surprised if you knew some of the fellows I’ve got to take care of. It seems like I’m responsible for every crime that takes place in this country. The country wanted booze and I organized it. Why should I be called a public enemy? I am just a businessman, giving the people what they want.